Have you ever been locked out of your own home because you lost or forgot your house key? Have you ever forgotten to lock your door? With a keyless entry system, that will never happen again! A keyless entry system allows you to unlock your home using a keypad, key fob or card, smartphone, or fingerprint. Many of these systems will automatically lock your door after a preset period of time. Some systems provide more than one access method. Systems with a secondary access method can be especially convenient in the case of a lost key fob or smart hone. These systems allow for multiple users. An electronic door lock can add convenience and can help keep your home safe and secure. Keypad entry systems were the first type of keyless entry systems. 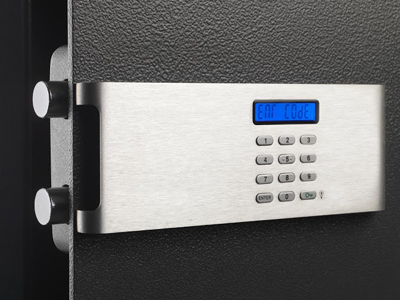 With a keypad system you use the keypad to enter a code or PIN to unlock the door. These systems first used a keypad with physical buttons and many still do, but some newer systems now use a touchpad screen rather than physical buttons. Better touchscreen systems include added security features to make it more difficult to guess or figure out the passcode. Radio Frequency Identification (RFID) locks use a tiny transmitter inside of a key fob or card to unlock the door. The smart lock reads the RFID device signal when it is nearby and unlocks the door. A smartphone Bluetooth-enabled system works similarly to an RFID system. You install an application of your smartphone that transmits a Bluetooth signal that your lock reads to unlock the door when you approach. A biometric systems scans your fingerprint to identify you and unlock the door. You may be familiar with fingerprint scanners if you have used them on a smartphone or laptop. You program these systems with your fingerprint, and then it checks to see that the scanned fingerprint matches the fingerprint on file to confirm your identity. Some of the keyless systems can be remotely opened from an application running on your smartphone. If you are away from home and need to provide someone access to your home, you can unlock it remotely. Some systems provide an access log so you can see who accessed your system and when. More advanced entry systems can integrate with a smart home automation system for added convenience, security and protection.